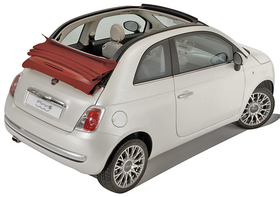 Fiat's 500C convertible debuted in Italy last week. BALOCCO, Italy -- Chrysler will build and sell four versions of the tiny Fiat 500 in North America starting in 2011: a hatchback, convertible, station wagon and sporty hatchback. A fifth model -- a small, four-wheel-drive SUV -- also is possible. They will wear the Fiat brand, and no longer-term plans exist for other Fiat-badged models here, the company said. Roberto Giolito, designer of the 500 and head of styling for the Fiat brand, confirmed the plans here last week at the launch of the 500C convertible. The sporty hatchback is the Abarth version of the 500 hatchback, the popular 2008 European Car of the Year that Chrysler/Fiat CEO Sergio Marchionne calls "our iPod." The 500, which debuted in Europe in 2007, is scheduled to go on sale in the United States in the first half of 2011, said Fiat brand CEO Lorenzo Sistino. Production in North America is expected to begin in early 2011 at a Chrysler plant either in the United States or in Toluca, Mexico.